All is not well in the Technology world, especially the booming mobile sector. Large corporations are in an arms race for broad and overly general patents, most of which cover designs and software they didn’t even invent. Those with the means to do so are buying old patents from failing companies and patent holding firms for billions of dollars (Google bought Motorolla’s mobility patents for 12.5 billion dollars, Microsoft just dropped 1 billion on old AOL patents, Nortel’s patent portfolio was scavenged for 4.5 billion by various companies). Why spend astronomical sums on old patents? To protect themselves from litigation and to use the old patents as landmines for other companies to step into and explode themselves into a courtroom. There they can expect to spend upwards of 2 million dollars in legal fees. The consequences of losing, however, could be worse than that. Apple, for instance, is trying to block the sale of Samsung’s upcoming blockbuster Galaxy S III. And that’s not all Apple is trying to shut down with patents. HTC models are being held up from being sold in the US while HTC changes its software due to Apple’s civil suits against the company. 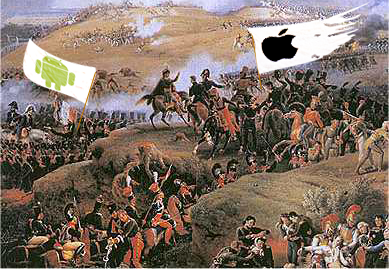 All of Apple’s patent suits against phone manufacturers are in fact a proxy war against Google’s Android. The rulings Cupertino are looking for are so broad that the ramifications of adverse decisions for the defendants impact how Android fundamentally works. Apple isn’t the only company using the blunt instrument of court action to secure its market share and stifle the competition. Microsoft, Oracle, RIM, even Kodak and a plethora of others are using their existing patents and patents they have purchased to drag each other into court. If this is bad, then the “Patent Trolls” or non-practicing entities are worse. Non-practicing entities are patent holding firms who buy patents, and that’s it. They amass hundreds of patents on the claim that they simply try to defend the interests of inventors without the means to defend those interests themselves. In practice, they hunt down any possible or imagined patent infringement and try to beat a settlement or licensing agreement out of defendants. One such company, Intellectual Ventures, has raided $5 billion dollars from the tech industry. Intellectual Ventures and companies like them now earn 77% of the average total damages awarded in US patent lawsuits. As it stands, if you are a small company making innovative products and don’t have millions of dollars to throw around at lawyers, then it is not a good time to be you. The Patent Wars make it very hard to be a smaller company with new ideas as you absolutely must hold a patent now, lest some larger company patent your idea first then sue you for licensing. Congress has enacted laws in a rare show of bipartisanship to help streamline the patent filing process and to try and stem the tide of frivolous lawsuits. As per usual, however, the value of this law is big on intention and short on deliverables for small business. In short, the patent system in the United States is stacked, not only against the little guy, but everyone. No one, at least they claim, likes all the litigation and legal headaches of the patent system as it is implemented today. For things to get better, drastic steps will need to be made to software patents.